Pat Poels: Better than a 2-Hit Wonder? A few updates … team captain Tom Schneider is off to a solid start, with a mid-cash and a min cash after four events … playing now in NL 2-7. Still tabulating results from Goldfarb, Ms. Schneider, Noam the Enforcer and a few yet-to-be introduced’s. Harris gives the $1k a second go tomorrow. And even Toothless Bob, bankroll-fortified by his B-squad Vegas alt-tourney wins, played his first ever hands of live PLO in Thursday’s Hard Rock game … and cashed out a small winner. Fans swarmed all around as the 2-7 triple-draw got to its final two tables, and Pat Poels began to think about his first bracelet in a non-split event. But so far, getting closest to the WSOP hardware has been Pat Poels, the other 2-bracelet holder on Team Pokerati … who finished 10th in Event #7, $2,500 2-7 Triple-draw for a $13k+ payday. 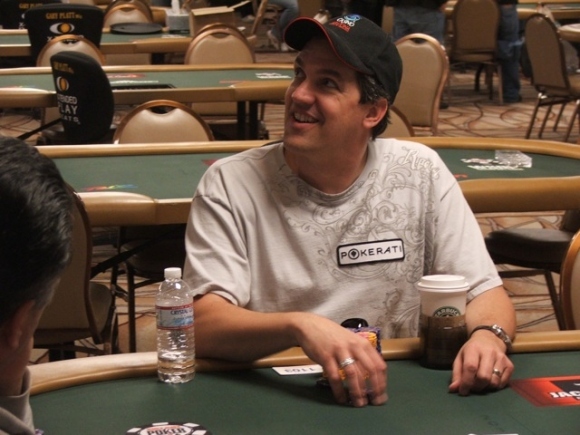 The Casino Arizona host knows he can play, but comes to the 2010 WSOP with cashouts meaning more than they have in previous years and a desire to prove to himself that there’s still room for a player like him to earn a respectable living by outplaying the competition in a wide variety of games. My plans are to induce pain, and to collect buy-ins. Bio? Well, I like warm bubble baths and long walks on the beach, and mean people and taxes turn me off. And I’ve had a 3-year gap since my last bracelet. Time to fix that. They’re back in action in 2.5 O8B (bear with me, still experimenting with new abbreviations) … Mike Matusow is out, but with 14 players left Team Pokerati-er Pat Poels is climbing back hanging on for dear life. 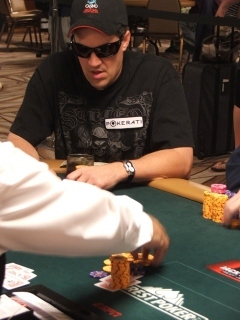 Mark Tenner is the chip-leader, but imho the guy you really have to watch out for is Mark Gregorich. This game caters to his style, and with half-a-table of knockouts to go before the final, fifth chip position is arguably a stronger spot to be in than momentary #1. UPDATE: 12 left … but Poels involved negatively in the three-way-action scooped pot that knocked out Patrice Boudet. OK, now 11 left … Pat still near the bottom, but with more relative chips. 8th overall — and that’s with having just lost a pot. At the same time, even a double-up right now would still leave him in 8th place. UPDATE: Poels = 9th. Nice-ish. Davis never held the chip lead until the first hand of heads-up, when he doubled through runner-up Scott Buller with pocket aces against Buller’s pocket nines. The final hand had Davis’ A-9 best Buller’s A-J when another 9 came on the turn. Play also resumes at 1pm in the $2,500 Omaha Hi/Lo 8 or Better event with 23 players remaining, with Mark Tenner leading the field at 285,000. John Monnette (237,000), C.K. Hua (225,000), Day 1 chip leader Josh Schlein (201,000) Frankie O’Dell (194,000), Mark Gregorich (108,000), Pat Poels (89,000) and Mike Matusow (63,000) are the notables looking to pass the Omaha-8 author. Barry Greenstein (177,200) will lead the remaining 67 players in the $2,500 Mixed Holdem event when play resumes at 2pm. Notables also making a return on Thursday include: Hasan Habib (165,000), Daniel Negreanu (101,000), Amnon Filippi (98,000), Mimi Tran (65,300) and Gavin Griffin (46,600) with 54 players making the money. Only one tournament this afternoon, the $1,500 Pot-Limit Omaha 8 or Better event, won last year by Martin Klaser winning over $210,000 in a field of 720. The WSOP Staff Guide projects a field of 756 for this event, and expect less than 20% of the field when play concludes at the end of level 10. Follow along at www.wsop.com for updates starting at noon PT, and Pokerati will have more stuff from around the poker community during the day. 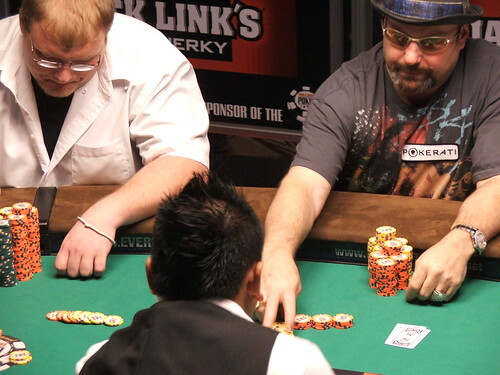 Team Pokerati-er Pat Poels is going deep in the $2,500 Omaha Hi-Lo. With 28 players left (out of 424) he’s about 10th in chips. Should be interesting … though he’s cashed a few times this WSOP, his net isn’t too much better than Tom’s for 2009. He knows how to win it — Poels booked his first bracelet in the $1,500 version of this event in 2005, and fortunately it doesn’t look like big money payout differential decisions would come into play until the final 5ish. CK Hua is the threatening name at near the top of the stack-count, Max Pescatori is hanging on in the relegation zone, and in the middle with Pat, @TheMouthMatusow is alive and growing stronger — and he’s twittering that he’s on a mission to win it … so that threat’s out there.